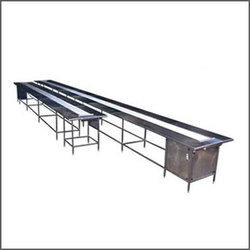 Exporter of a wide range of products which include screw conveyors and packing conveyors. We offer an array of screw conveyors which is used to carry materials that transfer crushed materials from one place to another. Our team of skilled engineers and designers has designed these screw conveyors from quality raw material to ensure durability. Used to collect, transfer, meter feed and distribute scrap material. Screw conveyors are designed and engineered specifically for each application and are available in various diameters and trough configurations. Excellent when used in shredder feeding applications. 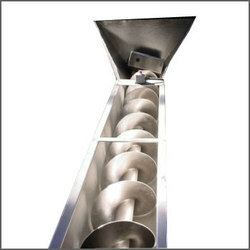 Screw conveyors easily convey wet or dry chips and turnings. Low housekeeping required - no return section. We fabricate a wide range of packing conveyors which is particularly designed for constant process from one department to other department, maximum lengths are available. Our range of packing conveyors is manufactured from SS 304 material quality to give the smooth finish. Entire surface is Matte polished to give the uniform and the best finish. The packing conveyors will be assembled in the single piece construction type design and only one motor & gearbox will be provided with the unit to give the precise alignment. We provide our packing conveyor with food grade "PVC" coated continuous belt so that there will be no crevices & therefore no contamination.